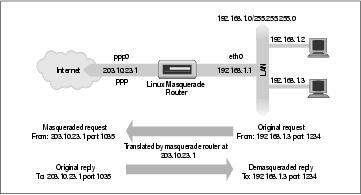 IP masquerading allows you to use a private (reserved) IP network address on your LAN and have your Linux-based router perform some clever, real-time translation of IP addresses and ports. When it receives a datagram from a computer on the LAN, it takes note of the type of datagram it is, “TCP,” “UDP,” “ICMP,” etc., and modifies the datagram so that it looks like it was generated by the router machine itself (and remembers that it has done so). It then transmits the datagram onto the Internet with its single connected IP address. When the destination host receives this datagram, it believes the datagram has come from the routing host and sends any reply datagrams back to that address. When the Linux masquerade router receives a datagram from its Internet connection, it looks in its table of established masqueraded connections to see if this datagram actually belongs to a computer on the LAN, and if it does, it reverses the modification it did on the forward path and transmits the datagram to the LAN computer. A simple example is illustrated in Figure 11-1.